Very Charming family home! Country setting but close to amenities! Large living room with plenty of natural light, eat in country kitchen, formal dining room, and very large bath. 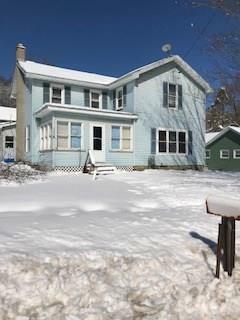 4 bedrooms and side enclosed porch which leads to partially finished basement can easily accommodate an office space. First floor laundry! Large two story detached garage/ barn with electric to store your vehicles and other outdoor equipment. The well is only 5 years old! L shaped/corner lot with spacious yard for all of your outdoor activities. Falconer School District. Home will be sold as is. Call for showing today! Listing information © 2019 CNYIS, GENRIS, WNYREIS. Listing provided courtesy of Premier Listings Real Estate Llc.